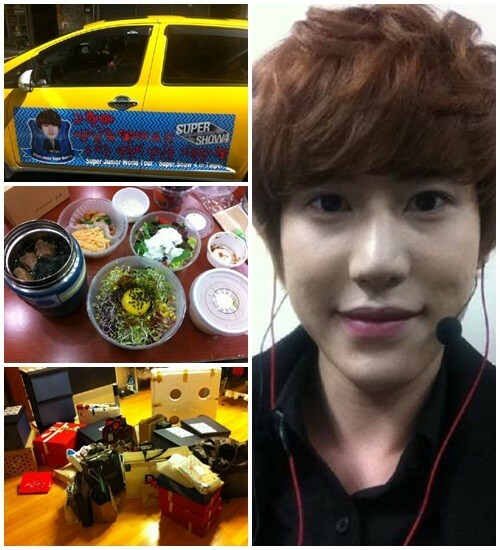 Super Junior Kyu Hyun express his appreciation for his fans. Kyu Hyun posted 4 photos on his twitter on Feb 28 with a comment saying "Still wrapped gifts from fans and self-camera photo of thank you by me!". In the photos, all kinds of gifts and lunch boxes from fans can be found. In other photo, Kyu Hyun is giving shy smile to a camera. Netizens commented "such a adorable cute boy", "nice fans".